Associate Researcher Pitt Rivers Museum, Oxford, UK. As Artistic Director, I am interested in shining a light on the active, stable and rich pre-existing collaborations and connectivity of Indigenous and Edge cultures. I aim to work together with artists, collectives and communities, from Australia and around the globe, to reconfigure the world as we see it and reveal rich local and global rhizomes and unique individual cultural expressions in one place. 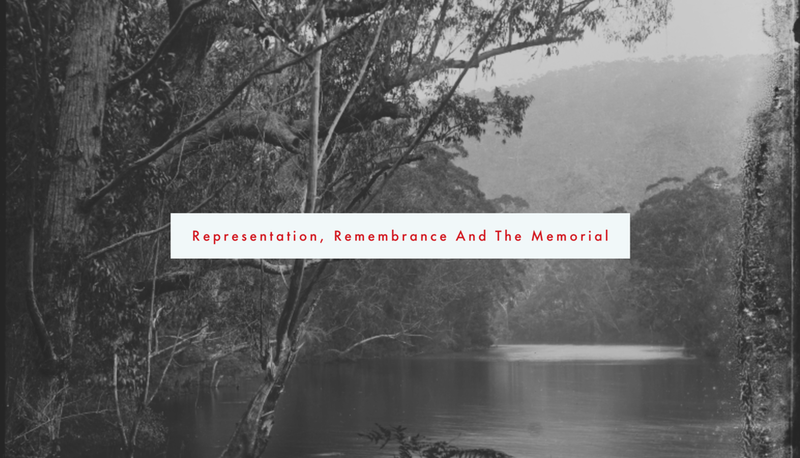 Representation, Remembrance and the Memorial, http://www.rr.memorial, is an international visual arts research project that concerns the Australian frontier wars and the possibility of representing the magnitude of Indigenous loss and survival in a national memorial. The project is led by Brook Andrew, with research assistant Dr Jessica Neath and mentored by Professor Marcia Langton. The project follows several lines of enquiry including investigating international examples of monuments to genocide and community approaches to remembering frontier violence. Research activities and outcomes include interviewing memorial experts, site visits, archival research, hosting a forum, developing artworks, writing a set of guidelines and publications. RRM is funded by a grant from the Australian Research Council Indigenous Discovery Program (2016–2018) and is auspiced by MADA, Monash University. The project is based in Melbourne, Australia. We acknowledge the people of the Kulin Nation as the Traditional Owners of the land on which our office and studio resides. On residency at Künstlerhaus Bethanien, Berlin. Research on the representation of Australian Indigenous loss by learning from German memorials relating to genocide and fascism. This project is motivated by the lack of memorials to the frontier wars in Australia where in-numerous first peoples were murdered and in the aftermath - cultural genocide. This work does not compare historical traumas but investigates the methods of display: how have artists, architects, communities and institutions in Germany and surrounding Europe made traumatic histories visible in the public sphere? Research the National Anthropological Archives and Human Studies Film Archives in the Department of Anthropology at the Smithsonian Institute, Washington, DC, part of his Smithsonian Artist Research Fellowship (SARF). The extensive collection on ethnology, field-notes, correspondence, photographs, sound recordings, film and video in these archives, extends Brook's current and past research, specifically at the Pitt Rivers Museum, Oxford; Museum of Archaeology and Anthropology, Cambridge; and the Anthropology Department Collection, University of Vienna. By working with these collections Brook's intention is to discover new images, video and sound recordings that many Aboriginal people in Australia have not seen before and at times cannot be found in Australian collections. Invited by Rashid Rana, the Pakistan-based artist to participate in Present Elsewhere - an inquiry into the possibilities of fiction to construct multiple pasts through notes, images, and schematic representations of his collaborative work-in-progress. Link to publication here. In 2016 as a Photography Residencies Laureate at the musée du quai Branly, Paris, Brook created the series The Resident and The Visitor which investigated the relationship between the colonial photographer and the sitter. Brook Andrew with his collaborator Trent Walter, created the public artwork Standing By Tunnerminnerwait and Maulboyheener in 2016. Installed adjacent Melbourne Gaol, this is Australia’s first official government supported memorial to the frontier wars. Read a reflection on the project here. On residency at Les Récollets in Paris Brook developed new artwork for a major solo exhibition at Galerie Nathalie Obadia, titled The Forest. Throughout the residency, he collaborated with Photographic curator Christine Barthe of the musée du Quai Branly, curator Valentine Meyer and French anthropologist Barbara Glowczewski. Glowczewski and Barthe’s investment in Australia and the context for France provided unique and valuable insight into the legacy of international study and reflection on indigenous cultures. The new work explored the space between cultures and the desire to be ‘in the middle’. It further questioned if this space indeed exists. Brook states: "The work drew upon my own experience, coming from Wiradjuri (Australian Aboriginal) and Celtic ancestry, and the manifested expectations formed within these so-called ‘immensely different’ cultures. Reflection within this space is often curious regarding the manifested expectations of how my culture or body should be. The desire and fascination with difference is a powerful place to work within." On residency at Centre Intermondes, La Rochelle, Brook Andrew undertook research at ‘France Archives departementales Charente-Maritime’. The documents accessed here connected to documents from British/Australian slave owners from the early 19th Century held in the University of Melbourne archives. This research informed two solo exhibitions in Australia: Sanctuary: The Tombs of the Outcasts, at the Ian Potter Museum, Melbourne; and EVIDENCE at the Museum of Applied Art and Sciences (MAAS), Sydney. This residency was supported by Creative Victoria and Australia Council for the Arts. Residency at Sa Sa Art Projects, Phnom Penh, Cambodia for research at the Choeung Ek memorial and the Tuol Sleng Genocide Museum (S-21 Prison). Meetings and interviews with members of the Documentation Centre of Cambodia. This research was supported by Creative Victoria and fed into his research for Representation, Remembrance and the Memorial (RRM).